JB: Were there any local players that inspired you? I was born and raised in Webster, N.Y. when I first began playing guitar I was very fortunate to have John Bucci, Steve Greene and Mark Manetta for teachers, great players, great guys and great teachers. When I moved to New Orleans, LA. I was overwhelmed by the number of amazing musicians, there are so many great players here I’m afraid to name names I don’t want to leave anyone out, so here goes in New Orleans I’ve found inspiration in the playing of Mr. Warren Battiste, Hank Mackie, Steve Masakowski, Carl Leblanc, Phil DeGruy, Cranston Clements, Deacon John, Leo Nocentelli, and all of the cats I work with on a regular basis. The main thing I find inspirational about all of these players is their commitment to the music and the development of their own unique sound and style. JB: How old were you when you started to play jazz guitar? I began music studies at the age of seven with the piano, then at nine I began playing the French Horn in school. I continued these studies through High School. I began playing guitar when I was 16 after seeing Stevie Ray Vaughan in concert. It was one of the most compelling moments of my life up to that point. My father was and is an active musician (trombone) and he encouraged me to give myself to the guitar. I was always aware of jazz through my father and his album collection, but it took a few years of me rockin’ and rollin’ and bluesin’ out before I heard the jazz guitar album that really turned me on to straight ahead jazz guitar. All in all I began attempting to play jazz guitar at twenty and became more or less adept at it around twenty seven. Now here twenty something years later I am constantly learning something new about it every time I play. JB: To you, what are three of the most influential jazz guitar albums and why? That’s a tough question, my first reaction is to say everything that Ed Bickert recorded. For me the most influential jazz guitar album is Ed Bickert with Lorne Lofsky on “This Is New”. This is the album that fully opened my ears to the beauty and complexity, the soulfulness and taste of straight ahead, mainstream jazz guitar. When I first heard it I knew it would take years of studying, practicing, playing and gigging to genuinely represent that degree of artistry and mastery. The pursuit of this has been my guiding light since I first heard “This Is New”. The next most influential jazz guitar album in my life is Bill Frisell with John Scofield on Marc Johnson’s “Bass Desires” album. I loved the ECM sound and this album was a bridge from Pink Floyd and RUSH into jazz. Through this album and interviews I read with Bill Frisell and John Scofield I got turned on to Jim Hall, Wes Montgomery, Pat Martino etc.so it was a big part of my growth. The sound, texture and arc of the pieces and the flow of the improvisations reall hit home with me. The third most influential jazz guitar album in my life is James “Blood” Ulmer’s album “Freelancing”. I heard this album when I first began guitar and was deep in Hendrix and Stevie Ray, this album opened up the jazz guitar door for me, in the sense that jazz can be wide open and absorbing of many styles, genres and personalities. It is a great album mashing Ornette’s Harmolodic concept with back beats and disco beats, it is a CRAZY album! JB: What are the three most important jazz albums by instrumentalists other than guitarist and why? These are hard questions to answer Joe. I really connect with vocalists in jazz. One of my favorites is Joe Williams, his track with Count Basie, “The Five O’Clock in the Morning Blues” is a masterpiece, an endless source of inspiration for me. By that I mean I have listened to this track for a thousand hours, over and over again just being blown away by the heart and soul and sound of this particular track. Next for me is John Coltrane’s “Coltrane’s Sound”. This album has been another one of those albums of non-stop endless inspiration, where I have burned out three copies of it and still go to it for more. “The Night has a Thousand Eyes”, “Liberia”, “26-2” all pretty much state of the art even now forty some years later. Another album of endless inspiration for me is “Miles Davis in Person Live at the Blackhawk”, the track in particular on this album is “If I were a Bell” at one point in my life I listened to this one track for days and days in the car, in my apartment, on my Walkman I was obsessed by this track. I have to throw in Ahmad Jamal’s “Legendary Okeh Sessions”, Ray Crawford’s guitar playing is AMAZING!!! Oh wait this isn’t supposed to be about guitarists. JB: Which two CDs of yours best represent your playing and why? I am tempted to say the next one, that will be the one where I finally get all of me onto a cd that I am unreservedly proud of but until then. My most recent recordings “Hocus Focus” and “Trio De Joie” are most representative of my playing up to this point. “Hocus Focus” is a cd where the intent was to incorporate many influences and genres into the “sound” of a straight ahead trio.With “Hocus Focus” I was heavily into complexity of harmony and form. “Trio De Joie” is my soul jazz trio that brings all of my pop and r&b influences to the fore. I was a kid in the seventies and grew up loving Billy Preston, Chuck Mangione, The Jackson Five, Earth Wind and Fire, Blood Sweat and Tears and all of the jazz rock that was on the radio, “Trio De Joie” is my project that gives voice to these influences. 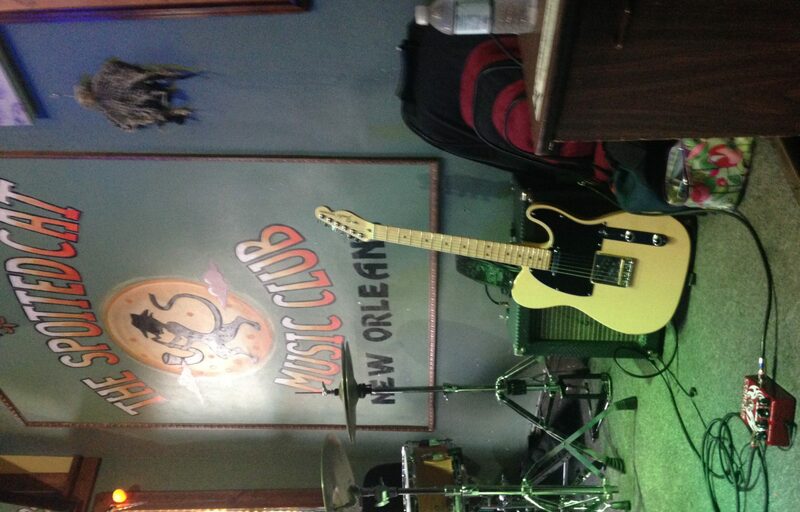 JB: Talk about the jazz scene in New Orleans and the gigs that you do. The New Orleans jazz is profound. It is the oldest jazz tradition in the world. On any given night there is jazz being performed ranging from Traditional New Orleans Jazz to Improvised Music (free), Jazz here is a living, breathing entity that informs every aspect of its participants lives. I play 250-300 gigs a year from funerals to weddings, clubs to festivals. I play solo jazz guitar, various duo lineups and in several trios. I play in rhythm and blues/funk/neo soul groups with horns and I play in a modern jazz quintet. I get great pleasure from being involved in many projects that are different yet all related to jazz in one aspect or another. JB: Are you employed outside of being a guitarist? If so, how do you blend that and being a jazz guitarist together? In addition to my relatively busy gig schedule I am absolutely blessed with a full time music teaching position at The Lynn Oaks School in Braithwaite, LA. I teach music to pre-K 3 through Eighth grade, beginning and middle school band. I have degrees from Berklee College of Music and the University of New Orleans, which have enabled such a fulfilling and satisfying day job. Working with young musicians is one of the most inspiring parts of my life. JB: Talk about what goes on in your mind as you solo over a tune like All the Things You Are. On a good or a great night when the band is making magic music happen and I am soloing on “All the Things You Are” what goes on in my mind is as indescribable and illusive as it is real. It is a state of grace where all of my faculties and senses are fully open and the band and the audience are all connecting in a beautiful, peaceful, telepathic way that is as real and tangible as it is difficult to describe. Whatever this is called I believe this is what the audience is there to experience and it is my role to facilitate this. For me it is a sacred joyful experience which I am grateful to be a part of. Not to sound trite but at this point in my development I really don’t “think” when I play anymore, I just listen and respond. Music has taught me how to “quiet” my mind. I save the thinking for the shed. JB: What are you thinking about as you are comping ……. behind a solo singer? When I am working with a vocalist my main focus is to create a big, deep pocket of time so that the music feels good. I focus more on the bass side of the guitar and keep the chord voicings in a place where I am supporting the vocal melody and really serving the song. JB: What about comping in a combo with a pianist? Working with a pianist it’s all about them, what with ten fingers and seven octaves they have a LOT of musical power. A lot of it depends on which school of piano they are coming from? If it is Ahmad Jamal then I have a chance to bring out my inner Ray Crawford, if it is Oscar Peterson then I will be wishing I had spent more time shedding Herb Ellis, if it is McCoy Tyner then I get to stand there and wish I was the piano player I mean I love McCoy!!! Seriously though my main focus in any musical situation is to LISTEN and blend in. I don’t need to stand out, I just want to make everyone around me sound better and make the thing swing. JB: Tell us about the guitars that you use? I use a Heritage H575, a Gitane D500, a Gibson ES137, a Fender “fat” Tele (my Ed Bickert tribute rig),a Taylor 412e, a Fender “Blacktop” Strat, and a Rodriguez Nylon String on 192.168.l.254. JB: What amp do you use? I use either an Ampeg JetII, a Rivera Clubster 45, or my ZT Lunchbox. JB: What advice would you give to young jazz guitarists? My advice for a young jazz guitarist is to be in this for the music, the musicians, the crazy gigs and the joy of living as an artist. Learn the lyrics to the standards you are working on. Learn to sing. Believe in and follow your dream but be working towards tangible goals with a plan, and a backup plan, money is necessary. Love never fails so if you truly love being a musician and completely commit your life to being the best musician you can be you will eventually succeed. Comparison is the thief of joy. Read Rainer Maria Rilke’s “Letters to a Young Poet” many answers abide within this book. Trust yourself, to thine own self be true.